Our group circle hovering between worlds. Aluna Joy Yaxk'in, The Original People, Archangel Michael and a huge Etheric Healing team. Received 9/1/17, and called to release on 10-28-17. The circle would not allow me to post photos without making them otherworldly and unrecognizable to reality. I received this message in such a crazy, spherical fashion, in bits and pieces, that when I got home, it was really hard to make linear sense of this recording. I had to read it many times over weeks to make sure it flowed in a way that could be understood. But when we were on the ground in Scotland that day, it made perfect sense to us all. I hope I don't lose you in this message somewhere. It is very deep, huge and hard to explain without having you been there with your boots on the ground. I am certainly asking for our higher powers to help with this transmission. I feel it is an important and crucial message, and so did our group. I did my best, and now it is in Spirit's hands, and I expect that those that need to read this . . . will. 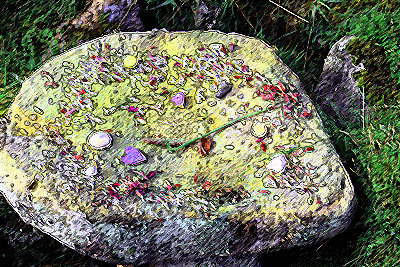 We entered the last stone circle of our Scotland pilgrimage, and my heart sank. I thought. . . "Oh no. 'This' is going to be our last experience of our travels?" I felt deep sadness, profound loneliness and unimaginable abandonment from this site. I felt that the spirits of this site were the last outpost, or strong hold, for their work in this area. This was the end of the line for them. I backed away from the center of the circle, thinking that this was going to drain my energy like no other site had. Psychically digging into a site like this can wreak havoc on your body and your soul. This is one of those places that makes you wonder in the wisdom to dig into what is here (what I call spiritual archeology), and find out what its story is. So I kept backing away, but the site kept reaching for me. At one point, there was no turning back, and I had to do it. We were here, and I had to follow through. At first I was not comfortable with the task in front of me, but this changed. As I began to share my concerns to our group, about exposing this energy to the group after such a powerfully positive pilgrimage, others began to share what they were seeing as well. We all were getting the same story that was anchored here. Because of this, one group member finally realized that she could read sites too! This was a priceless gift to me. I felt like I had done a good job as a guide. The focus on our pilgrimages is always to empower each person to see for themselves and be self-sustainable in these new gifts. Our humble offerings. It was not a place to receive, but to give. We all knew there was something to do here, but we didn't know what it was. As we dug through many layers of pain, loss and abandonment, I started to see ones who I called "the original people". They landed here from their home in the stars to watch the Earth a long time ago. These original people felt invisible, lost, and they really needed to be "seen and heard". Then they began to share, and they said "We miss you". They knew who we were! So now I was hooked, and you could not stop me, or our well-seasoned group, from digging to the bottom of this stone circle's mystery. Their work was to anchor huge amounts of energy, so they could be seen in other sacred sites around the Earth. I asked why this needed to be done, and they shared more. When something happens in a sacred site, we can feel it in other sites. This is why we always say to walk in a scared way when we enter these special sites. Most sacred sites today are connected to one another on a grid system that was built by these original ones. These starry ones knew that connecting sacred sites (various powerful points around the Earth) would build a powerful grid worldwide. This grid was to anchor "Home" or "Paradise" on Earth. Many other star people had landed in other places around the Earth. They could beam up and back again at will for many cycles of time. 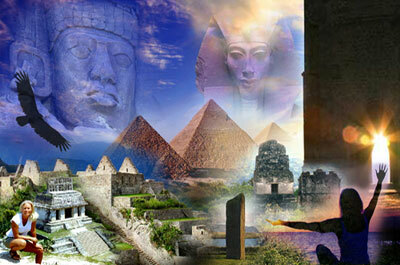 Palenque, Mexico, the pyramids in Egypt, dimensional doorways in Peru, etc. . . are all such places. So they kept working and expanding their energy fields, so they could create their part of the world wide grid. They did complete this project. So I asked why they were still here, and I got a shocking and unexpected answer. Something else happened while they were working here, and they needed to call for the rest of their tribe to return home, because there was something else to do. There were many, many tribes of scouts in outposts all over the Earth at this time (You reading this might have been one yourself). They stayed here until they understood enough about the Earth and its cycles, and they built the ley line grids. Then they started sending light into the Earth's newly formed grids. Now the person we know as Christ, or Jeshua, was here long before he was in a body that we know about 2,000 years ago. Long, long ago, there were a lot of people like him. They would come and go from these base camps, or outposts, and they would stay for a time to complete some work. They kept sending out energy to make sure that the light threads were connected between other base camps. Each outpost was in charge of their location (all outposts were on what we now know as vortexes). All of these outposts were connected to the many other base camps who were also charging up their territories on the grids all over the Earth. We could see that their timelines were different than ours is today. Example . . . the length of a day to us feels like a certain length of time; but to them, it was different. Hundreds, even thousands, of years was not that long to them. So we assume that they have been waiting here for a very, very long time. They waited for their family to arrive, and also for an opportunity to go back home to the stars. I didn't feel starvation, famine or any kind of environmental or catastrophic issue that caused them to finally leave their bodies. They simply finally gave up their physical form, but stayed here in spirit. There was nothing left for them to do. They had finished their work and the energy grid system. Over many eons, they kept waiting to be seen here. The hardest part for them was their not knowing if their work was successful. This was because something unexpected happened during their landing that stopped their work from taking root fully. They wanted to be reunited with their starry family, but because of this "happening", there was something else they needed to do before they could move on. The reason why they kept sending out a cosmic S.O.S. was so other people from their tribe could "feel" that they were still here, in the hopes that they would come to release them after this unknown happening was seen and healed. We all decided that this was for us to figure out. So we kept asking questions and digging with our hearts. Once we all realized this fact, the sun came out in full glory as confirmation. 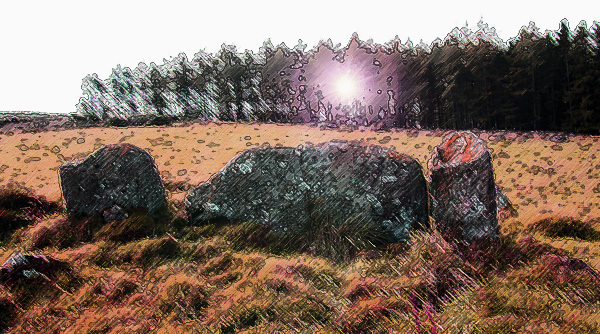 We noticed on our trip that every time we recognized the truth sealed in a sacred site, the sun would blaze through the Scottish mist and clouds. It was a great confirmation that we were hearing the message of these original ones. The energy that these original ones anchored here is very tangible and holds universal truth. It is a very attracting energy field. Future generations always find these places, whether consciously or unconsciously, and many of these places are very likely to be built on top of, over and over again, by future generations. The original ones were not the ones who built the stone site that we were standing on, or the ones who were buried here. These remains were added here much later by future generations. Maybe later ones felt like they could come to this place to beam up, or speak to the heavens, which by the way is not that far from the truth. Many would also want their special Elders to return to the heavens, like the Star People did, so they would bury them here where they knew the Star People had been. So now we are getting down to the unfinished business of the Star People that we (and those reading this) are to help with. These original people didn't want to move on until they cleared one big thing up. The happening. They wanted US to BE home; not go home (I know many of you have had issues of Be-ing home here this time around). This creation of HOME would happen when we fixed the one little thing that stops this paradise from manifesting in the Earth's grid. We began to feel that we (our group) were reincarnated from this tribe, and that we had now come back. (those reading this will know if it is true for you as well. I am sure there are many.) We are the ancestors that have returned, or maybe we were the ones that didn't return to pick them up. Maybe we are a little of both. Some of us went on to other places, and some of us stayed behind. Maybe today we returned to finish work. Then ... the BIG DOOR opened, and I was able to pick up on the reason why they were still here waiting, and maybe the reason why we returned here today. This felt like I was remembering a dream that quickly fades when you open your eyes. I could barely hold onto the edge of it. After some begging to the universe, so I wouldn't lose the very elusive door to the memory, it started to come back in pieces. I am going to start spitting out stuff quickly, and it might not be in the right order, but we will get to the bottom of this. (Most ancient ones and even the Star Elders speak in spherical fashion) If I don't speak it out loud quickly now, it is going to disappear. This is all about ... abandonment and why the state of the world is the way it is right now. We have come back to finish a job. The job is not to do work on the Earth grid today. The job is to assist in healing humanity. A majority of the people on Earth have "original wound" abandonment issues that were created when we all arrived on Earth. This could be a hazy version of the original sin Christianity speaks about. This reason is why the world is in such a quandary right now, and why we are facing extreme polarity, great separation and triggering massive clearing. All the worlds polarizing illusion is linked to ONE core original wound. It is linked to the fact that we all have been abandoned, lost, unseen and unheard (Those reading this will know if this applies to you). We are the Star People returned. The common link between us (and those reading this) is that we have come here to get a job done. This job was the building of the Earth grid, which they/we have done! But landing was unexpectedly difficult. The romance of the idea of terraforming a planet was meet with a harsh but stunningly beautiful, physically reality. They/we were not accustomed to limiting, physical forms. It was a very foreign land. Quickly after the excitement and romance wore off, they/we began missing home. They/we never quite got over the shock and trauma of being here, but they/we had a job to do, and they/we got to it. There is one thing that is holding us back from plugging into earthly paradise, this is because deep, down inside, we still want to go home, or find home. It is a crazy, beautiful but barbaric world. Most of them/us were in a form of primal shock as this is not what they/we thought we were signing up for. But we did. All of today's chaos in the world is created by this one wound. Most humans are in a struggle to to find home, to feel safe, to heal abandonment and separation, and to be seen and heard. (Even the need to control, bully and lie and abuse) We are constantly looking to find home in our communities, countries, and even home on this planet; but it is inside ourselves right now. If we can heal this void in ourselves, we can help heal this on the entire planet. This healing is taking place all around the world right now as reality wobbles on quick sand. We are beginning to fully plug into the big energy grid that we anchored here. This incredible time is a portal to go back and heal the original wound within the original ones, and today within us. We have returned to where it all started, and are revisiting the same frequency, but at a higher and much more critical level. So, what do we feel that blocks us from feeling at home? The group began to share what they felt might block them. Fear of letting go, because everything will fall apart if we do? Fear of getting left behind? Fear of not being seen? Fear of being alone? Fear of being different? Fear of not being heard? Fear of being separate from the Source? Fear of not being good enough? Trust issues? Fear of getting stuck on Earth? So the original ones say that it is time for us to turn inward and heal this original wound within us. This is a challenge for true servers of the light and healers. We feel that anytime we put ourselves first, like taking sacred time for ourselves, or taking a sacred journey, etc. . . , it feels selfish. We find it hard to say no to things people ask of us that are not truly resonating in or hearts. But as these original ones have already taught us, everything is connected. What we do for ourselves radiates out and is felt by everyone that is connected to us, and who they are connected to, etc... on and on and on. In Maya, this is called In Lak'ech ala K'in, and in a Sanskrit term, we can also say 'Namaste'. These are ancient sayings that recognize the Oneness and the connection to the God Source within us all. What I do for myself, I do for you. What I do for you, I do for myself. With this said, they are asking us to take time to heal ourselves first, because the world WILL follow. The original ones share . . . not feeling good enough or taking care of themselves was not in the original star people's consciousness. This is a twisted tributary offshoot of the original wound that has manifested in modern day humanity. It was created from the original wound of abandonment. The original people had no problem honoring themselves. In our world now, we are trained to ignore the bad, uncomfortable feelings. When we are not real and truthful with ourselves, and we deal with the things as they come up, they morph into something even more complex, toxic and harder to clear. This is why the world is so complex and convoluted now. Most of what is being done with the world's issues is putting band-aids on a huge twisted wound. Band-aids only support the wounds; they don't fix them. I know, for all of us here (and those reading this), that our commitment is always to heal the core mis-creation and to not settle for the sugar coated band-aid. The core issue is the illusion of separation from Source, and that is where all the original abandonment wound came from. Also . . . trust was also never an issue with the original ones at first. It is also a tributary offshoot morphed out of the original wound. As a visualization, humanity's original wound looks like a huge tree. The trunk of the tree is our original wound, which is separation and a perceived abandonment from source. Because there was no resolution for the original ones, throughout time the tree began to grow branches, and then it even grew smaller, twisted branches. Each branch is a deep, covert, insidious, limiting, separate virus that has shut us off and separated us from BE-ing in Paradise. It has kept us from manifesting true home by using the Earth's grid system. 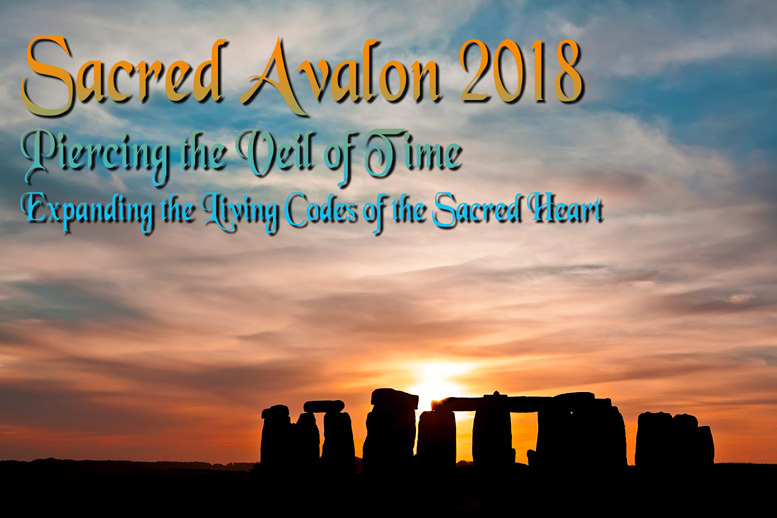 This healing will help us re-connect back to our true selves, our ancestor's original wisdom and the Earth's sacred sites on the Earth's grids across the planet. Now that we have clarified what our block to paradise is, let's ask to find a solution and begin the healing. So the first thing is to spend a moment and acknowledge the Star people's presence here. See them, hear them, honor their work, and acknowledge how hard it was for them to stay behind. Also, show them that they are not abandoned anymore, and that we will join them on this journey. So, I/we are going to ask what we can do about this original wound and trauma. They say that it is time now, and the door is wide open for us to completely heal this core, global wound/trauma of humanity all across the planet. But today, in reality, we are just a few people here (and the thousands reading this now), and what we start today will grow like a virus of Love. Old, outdated forms of consciousness will fall away now, and new temples will arise. We ask you to assist us in healing the core, original wound that is inside each of us. It is so deep that we really haven't been able to access it until now. It is time. We are being called to heal this together as ONE, and understand this can only be healed as ONE. We ask, with the power of our I AM Presence, that this ancient, core separation, abandonment, loneliness, deep feeling of not belonging, feeling of not being quite at home in our own skin and in these bodies (our human spacesuits), be erased from our memory. We ask, with the power of our I AM Presence, that the space this original wound occupied is cleared, transmuted, realigned and rebooted. We ask, with the power of our I AM Presence, that this pristine space be filled with peace, confidence and the ancient knowledge and the unshakeable knowing that we are always connected to Source. Archangel Michael and his full legion of light warriors are working together with the original base camp teams and us (and those reading this now). Also, they are working with all those that came before us, and all those that are around the world. This huge group of Masters, and our higher selves, are now working on completely erasing the initial shock wave they/we experienced. This sudden tiny bit of shock to be in a body is what started the original wound and the growing festering branches that followed. It is that little bit of shock, a sudden quick gasp that says, "I am not home, I am alone, I am afraid, I am going to get stuck here, etc. . . ." We are asking Archangel Michael now (and with your permission) if he/they would look at us all, and together, we ask that this tiny, little, original shock be healed for all the home based humans in Earth's base camps. I am saying this because you already know that you are part of an Earth base camp. That is why you are here. (Yes . . . you reading this too. ); every one of us. We are the ground crew! We are asking that our deep primal reactions to this wound be shifted into a positive. We cannot alter history or our stories, but we can alter our reaction to it. Archangel Michael and his full team of Archangels and all the Beings who we have called in are here now. They are taking us back in time to just before the core wound was mis-created. They are taking us back to when we first landed on this Earth, and we took on physical form. They see us full of hope, inspiration, passion and excitement. There was no question whatsoever that they/we could accomplish this task. Landing was quite shocking, but they/we rose to the task ahead, and they/we also felt deeply courageous and tenacious. Nothing would stop us from accomplishing this task. 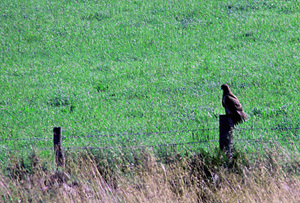 We heard the high pitched calling of a hawk as we reached this point and another hawk answered it. Lord Meru always shows up as a hawk. When Lord Meru flies overhead, it is a really auspicious sign. Lord Meru is the spear head of the southern chapter of the Great White Brother/Sisterhood - The Order of the Red Rose. Now I ask you to check in with yourself. Do you feel a touch calmer deep inside in a very, very subtle way? We are now going to ask that this peace and safe place grow and grow and grow in us until the homesickness goes away and is replaced with excitement, confidence and peace. We will no longer react from this little, ancient shock. We can now react from the totality of the light of who we are, and not just 99% of it. This is the last bit of healing that the Earth's base campers needed. Now we invite you to join us in sending this healing out into the world. From the ancient past, we call this healing to come into the present time, right now and wash across the entire Earth to assist the healing in every living, breathing, sentient being. We ask that the sudden shock be HEALED. We ask this IS SO for ALL humanity, and every sentient being in our current world. Now we spread this powerful healing and light throughout the ley line grid matrix that has kept Earth alive, and has made Earth a living being. We are going to ask that everyone's original wound be healed (Their higher selves will need to give permission for this to take place.). We now intend that that last little, tiny shutter of a gasp, that we experienced as we entered our bodies, be erased and be replaced with peace and confidence. So Archangel Michael and his full team, along with all those others who we have invited, are going across time touching all the creators of planets, the moons and stars, the stone builders, the circle creators and the grid builders. Then they will touch all in the global base camps, the light workers, energy healers, messengers and prophets. Let us send healing and light to all those who laid down the original grids and ley lines. Many are touched . . . ones we know about, and uncountable ones that we don't know about. We know that the world looks a little bit crazy out there in the material world, but do not think that this process is not working. (In fact, after we returned home, we all heard about the epic storms, fires, earthquakes and crazy people being reveled in their epic atrocities). These are accelerated times with accelerated symptoms of clearing this original wound being healed for all of humanity. This is the last little bit before we can pierce the very thin veil and embody the totality of who we truly are . . . which will allow us to come home to paradise. This is the one and only thing that has been holding us back all along. Altogether, here as one, we have now healed this ancient wound. 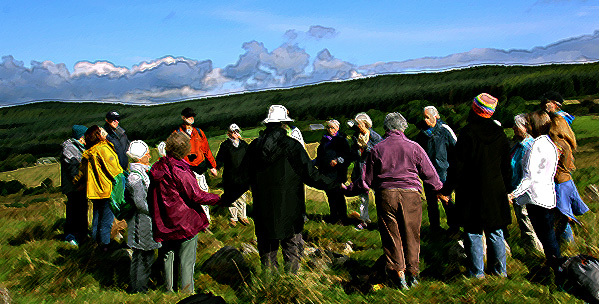 We empower this activity of light, this prayer, this healing, this re-remembering. We now re-ignite the original plan and create a huge domino effect that will now ripple all the way throughout time to pulse through all the sacred ley lines of which we are all connected. We ask this for all the courageous ones that stepped first in their human space suits on this planet, to all of those alive right now. We ask that this healing ripple throughout all wars of all kinds, big and small. We ask this energy healing ripple through all loss, all duality, all trials and challenges, and all the misuse of energy. We ask that this healing pulse of light weave through all the religions of the world that morphed into something that did not free and enlighten people. We see that these religions also operate from the great wound. They come from the abandonment that created the need to hold on to people, and a need to have a following. We see now how abandonment connects to all the well-intended religions that go out and say we need to save you, because they feel they need saving too. This healing is not taking away anyone's belief systems. This is not about erasing any belief system or religions. It is about getting rid of that need to fill the emptiness that the original wound created. It is about healing the core wound that made humanity lean toward dis-empowering people, instead of freeing and empowering them. We were naturally meant to be completely empowered. All religions are based in an original truth, but even this wound contaminated them. I want to thank the ancestors for letting us post this message. We know that this is really deep, but we really needed to hear this and finish this work that we began so long ago. We appreciate you so much for letting us enter into your memory, dear original ones, and inspire us to take your work a step further within ourselves and hopefully within humanity and the planet. We are so grateful to be here in this circle. It is an honor that we have been called to walk these lands. We want to thank all the Ascended Masters and all the Angels, Archangels, all the Legions of Light, all the Beings that have come with us, and all the ones that have just joined us. Ascended Masters of the South, the North, Jeshua, the Order of the Mary's, the Ancient Ones, the Essenes, and all those that braved this world before us, thank you for leading us step by step, stone by stone, and leaving a pathway for us to follow. We know now that the responsibility is now on our shoulders to take the next step. Then Jeshua says, "What I have done, you can do also and greater things." The greater things are coming now to be made manifest. Post note ... Here is the really fun part. As we did this healing in this remote circle that very few people come to, when we looked again, the original ones had gone. The site was clear of all the pain and abandonment that we felt when we arrived. This site was now cleared and empowered. I guess we were the ones who had the boarding passes for the original ones to finally go home to the stars. Their job was done. Safe travels Ancient Ones. We love you. We bless you and hold you in light. And thank YOU for reading this transmission, for joining us in timelessness for this healing. You are Seen, Heard and Known. *** Please save me at least 2 days work answering email. Please post, respond or comment on this article on our post on FACEBOOK at https://www.facebook.com/alunajoyyaxkin/posts/1725038240849261 THANK YOU!